"This is a delicious and easy salad which takes little time and is a great meatless main course. 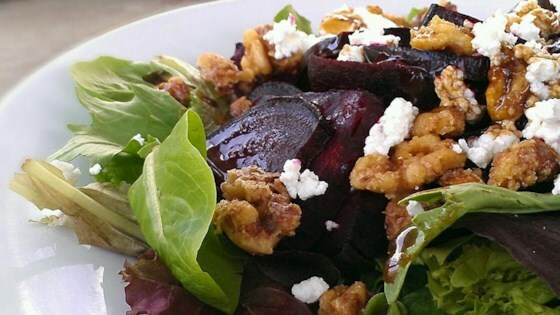 It uses beets, goat cheese, candied walnuts and baby greens. For a main dish salad, add chicken. Feel free to include more of your favorite vegetables too." This recipes was awesome. I used chilled canned beets instead of fresh beets and they were just as good. This recipe is very unique and flavorful. Definitely 5 stars. Took reviewers advice and used feta cheese. No one will be disappointed with this recipe. Everyone absolutely loved it.